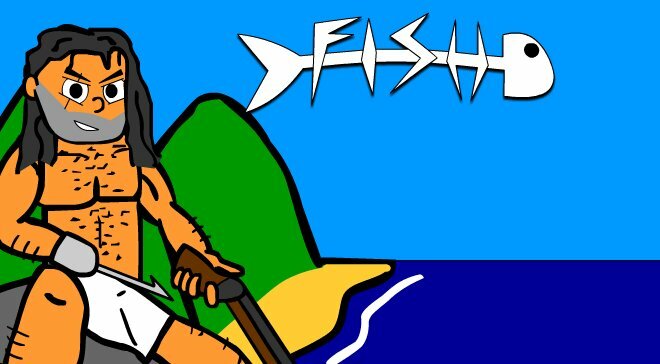 FISH - An old-school FPS with a hook. Now with a demo! TIGSource Forums Community DevLogs FISH - An old-school FPS with a hook. Now with a demo! So, this is an FPS inspired by early 90's classics like DOOM, Quake and Duke Nukem 3D. Like those games, it's fast and full of action but it also encourages a good amount of exploration with secrets and backtracking, something I think is missing on most games of the genre nowadays. I'm using Unreal Engine 4 with 2D sprites like DOOM, but a 3D world like in Quake. The reason is that I want a more retro look but I want to be able to have a full 3D environment and explore more verticality. The game takes place in a small generic caribean island that was invaded by fishmen pirates and are now in control. You are the "Pescador", the hero of the resistence, a strong and shirtless fisherman with a misterious past and a hook for his right hand. I'm still working out the details but he can also go back in time because of reasons. Don't expect something serious out of this. - A hookshot that can be used for movement, but also to fight enemies and solve puzzles. - A save system inspired by the ones in Ori & The Blind Forest and They Bleed Pixels. You can save anywhere you want but it costs you armor, so you have to decide if you want to save or to keep your protection. But unlike other games, you can get armor from the enemies you kill. Gonna try to keep this updated. Looks super fun! maybe some pixelart stylish to grab moar 90's feelings..
Nice! Are you using 2D plane static meshes with textures applied or billboard components for your objects/characters? Also, how is the animation handled? Really like the focus on exploration! Also any game with a hookshot has my attention. I like the look, and the decision to keep the graphics more simple to allow for more gameplay mechanics. Following! I'm using the paper2d sprite system that comes with Unreal, which are transformed into static meshes. I rotate them every frame so they're always facing the player. For each animation I made 7 more, one for each angle and depending on the angle between the player and the direction the character is facing I change it. Other than that it's pretty standard, the only problem here is that you can't trust on the mesh rotation anymore, I have to keep a second rotation variable to record the real rotation of the character. I might write a little more about this soon. Not much time to work on the game in the last few weeks but I managed to show it to some people and have a better grasp of what needs to be fixed. Turns out the game is way too hard right now so I'm trying to balance it better and fix some bugs. Some sort of small angler fish with a shotgun. He can't handle the recoil of the shotgun and is thrown by it. You can use that to make him kill himself... kinda cruel. This is the most adorable FPS I've ever seen. I wanted to update this every friday, let’s see if I can keep this up. Why friday? Because friday is fish day! At least in Brazil it is… I did a quick search and found out that there is a #fishfriday hashtag on twitter, so maybe it’s a global thing. Anyway, this is going to be just a status update. January was spent fixing what I already had. Fixed a lot of bugs, made some optimizations in the code, tweeked the difficulty and polished the art. Since the game is supposed to be a lot like old 90s FPS, originally I wanted it to have pixel-art sprites but I don’t have the patience or the skill to make pixel-art. I also don’t have the money to hire someone to make that for me so I ended up making some temporary sprites using an art-style that I’m used to and well, people seem to like it and I’m liking it so why not? I’m still trying to keep the polygon count low on the maps, but I decided to embrace the cartoony look and upped the resolution of my sprites so they would look a little cleaner. 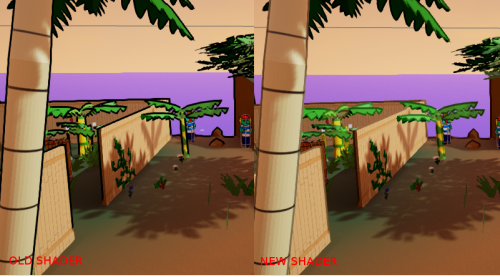 Also changed the outlines that all the 3D parts of the game have. They used to be all black, now they’re a stronger color of their model. Not because the black outlines were ugly but because I want consistency. Now only interactive objects (enemies and items mainly) have black outlines, like in a cartoon! It’s also very likely that’ll need to use 3D models for something interactive, maybe a boss even. Now the game is ready for that. And I know that crabs aren’t fish but I have a good reason to have crabs as enemies in a game about fishes: I like drawing crabs. Oh wow - I think the sprites look great against the background. Hahaha, and it took me a few watches to notice the the giant crab is holding cannons in his claws, and wearing a pirate hat. Love the details! Haha this game looks hilarious, I may have to get it for the crab alone. Also, have you made any considerations for the music/sound yet? Any plans for GNU/Linux support? Thanks. Yes, I'm already working with a musician for it, hope people like it cause it's going to be something very different from what we usually hear in the genre. Didn't knew that game! Pretty cool. Since UE4 has Linux support, it's very likely that a Linux version will be made. Ok that's cool. Well if you ever need any more, I'd be happy to contribute some music. I said I would update this every Friday but I’ve been too busy this week to write something, so have this gif which is almost a cutscene.